DTH writer Colleen Moir features Embody Carolina co-founder Colleen Daly, Campus Y Co-President Regan Buchanan, Embody Carolina Co-Chair Sarah Leck and committee member Teresa Ceballos in an article on the difficulties of suffering from an eating disorder during the college years, an extremely relevant topic during NEDA Week 2016 at UNC. "Being independent and surrounded by new peers in a new environment can be a dangerous combination for college students suffering from eating disorders." Read the full article here. The Embody Carolina committee is so appreciative of the DTH taking the time to write this editorial in recognition of our hard work on campus, specifically regarding our collaboration with the Lifetime Fitness program. Read the full Daily Tar Heel editorial here. McCall Dempsey returned to campus to host her third Southern Smash at UNC. DTH writer Hannah Smoot covered the body-positive scale smash in Davis Plaza on September 15 and spoke to co-chairs Sarah Leck and Bri Arey about the importance of celebrating freedom from numbers and having this discussion on campus. Read the full Daily Tar Heel article here. Co-chair Sarah Leck and Embody founder Colleen Daly were interviewed by DTH senior writer Anyssa Reddix for an article about Embody's ongoing collaboration with LFIT, their concerns about the dietary analysis unit, and their goals for changing how the curriculum discusses nutrition and eating disorders. Read the full Daily Tar Heel article here. DTH writer Jonathan Ponciano spoke to co-chair Bri Arey at the start of the semester about Embody's fall collaboration with an English 105 class. Students will help create videos for Embody trainings and generate social media posts. Read the full Daily Tar Heel article here. The DTH interviewed co-chairs Sarah MacLean and Bri Arey and CEED professionals Cristin Runfola and Lauren Metzger during NEDA Week 2015 to learn more about eating disorders, treatment options, and the work Embody Carolina is doing on campus. Read the full Daily Tar Heel article here. Southern Smash returned to UNC on Wednesday, September 18 for another afternoon of raising awareness for body image issues and eating disorders. Students gathered outside Davis Library to smash scales in order to draw attention to the need to start a different conversation around our bodies and self worth. Read the full Daily Tar Heel article here. NEDA Week 2014: "Embody Carolina envisions a healthier happier UNC campus"
Embody Carolina partnered with Carolina Dining Services, UNC campus recreation, and mental illness awareness organizations such as Active Minds and Rethink in order to provide a week full of events designed to promote body love and educate about the impact of eating disorders. Read the Daily Tar Heel's take on the week, and check out UNC' and Embody Carolina's spotlight in NIRSA News, the leading national campus recreation organization. On December 18th, 2013, Dr. Cristin Runfola, clinical assistant professor at UNC CEED, was on air with Signe Darpinian who wrote Knock Out Dieting: Create Peace Between You, Your Body and Your Food to discuss eating disorders in college students. Listen to the discussion here. Southern Smash 2013 "challenges women to redefine their worth and beauty by letting go of those perfect numbers that weigh them down." See the video here. 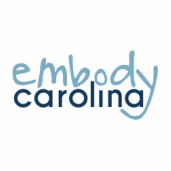 Embody representatives head to NEDA 2013 Conference in Washington, DC - UNC Exchanges blog post. Daily Tar Heel 2/26/2013 "Miss UNC Colleen Daly fights against eating disorders, promotes awareness"